Spain's Capital, Madrid, is a city with rich European art and famous destinations like the Buen Retiro Park, Royal Palace, and Plaza Mayor. The two most popular destinations to travel from Madrid to include the northeast to Barcelona and south to Andalusia. Barcelona is a great region for travelers who love art and architecture, while Andalusia offers hills, rivers, and farmland for those that want to explore the seaside city and Roman ruins. Other common places visitors can go to include other southern areas like Seville and Granada. Seville is famous for flamenco dancing and the Alcázar castle complex, and Granada has medieval architecture, royal palaces, and Generalife gardens. There isn't a high-speed AVE train from Madrid to Granada, although many other cities in Spain are connected by train. Because the train route isn't as quick as one might expect, it is recommended to take the bus. In fact, the bus takes roughly the same amount of time as the train, is much cheaper, and offers a direct route, unlike the train. If you're visiting the whole of Andalusia from Madrid, you might find it better to visit Seville before anywhere else. Madrid to Seville is served by a high-speed train service, connecting the two cities in around two-and-a-half hours. 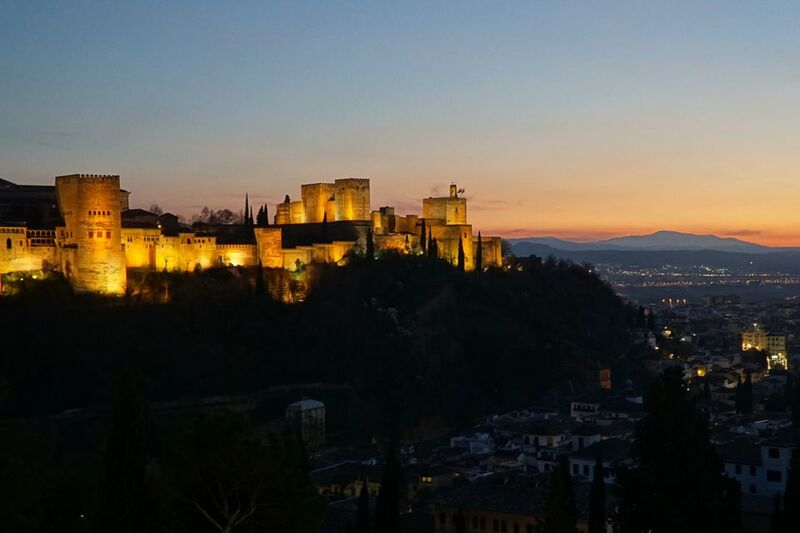 With this option, travelers can plan to visit Granada later on their trip. Seville to Granada costs about the same by either bus or train, so travelers are encouraged to take the one that's closest to their lodging accommodations. Along the way, several spots are recommended to stop at, including Ronda, Antequera, and Cordoba. Travelers can also take a full day tour to see all the top sights, including the Alhambra, a famous palace and fortress complex. Tickets to this destination sell out roughly a month in advance due to its spectacular world heritage site, so it is suggested to make arrangements with your hotel or online well before your trip. There are regular buses throughout the day between Madrid and Granada. The journey takes between four and six hours, costing anywhere between 18 and 35 euros. Buses from Madrid to Granada depart from Mendez Alvaro, and bus tickets can be booked online or through the app. Alternatively, travelers can take the train from Granada to Madrid, which takes about four hours and costs about 55 euros. Those wanting to take the train will have to transfer to a bus in Antequera, and tickets can be booked with Rail Europe. Trains from Madrid to Granada depart from the Atocha train station. Granada is a bit far for a day trip from Madrid, but there are several multi-day tours of Spain that pass through the city. The most popular one is the four-day tour of Seville, Cordoba, and Granada from Madrid. By car, the 430km journey from Madrid to Granada should take about four hours and thirty minutes, traveling mainly on the R-4 and A-44 roads. Travelers should consider stopping off at Toledo or Jaen on their way, to experience medieval monuments and cathedrals, as well as castles, Renaissance buildings, and more. Finally, there are regular flights from Madrid to Granada that can be very cheap if booked in advance. Nonstop flights take about one hour and often cost less than $100 while connecting flights are often more expensive and can last anywhere from four hours or more.